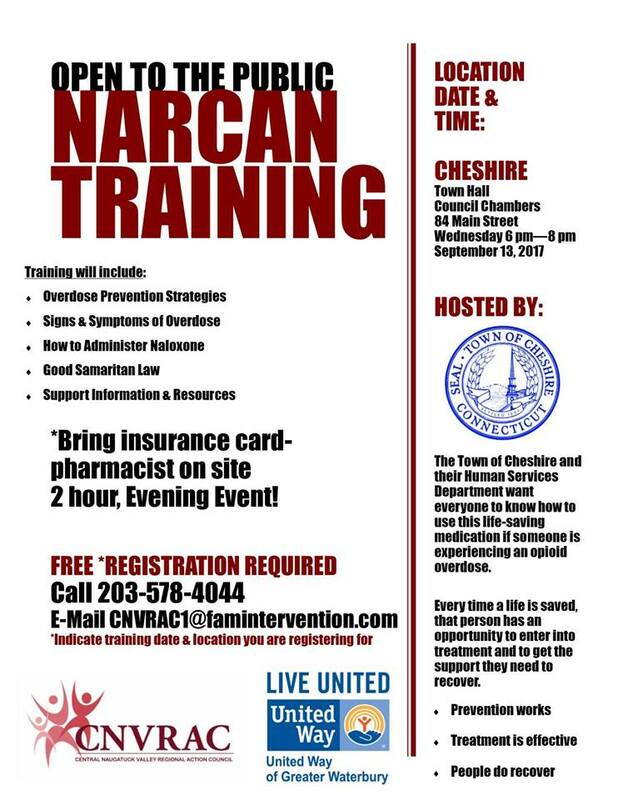 The Central Naugatuck Valley Regional Action Council (CNVRAC) is holding a training on the use of Narcan on Wednesday, September 13th. Narcan, also known as naloxone, is a medication used to reverse an opioid overdose, and you don't have to be a medical professional to obtain or administer it. No demographic or community in Connecticut has been left untouched by the opioid epidemic. Knowing how to use Narcan in an emergency could save the life of a family member, friend, or someone else who needs your help. Registration is required, and you can sign up by calling 203-578-4044 or emailing CNVRAC1@famintervention.com (be sure to mention the date and location of the training). This is just one of the great programs that CNVRAC offers to prevent opioid addiction and overdoses, and I'm grateful they're a part of our community.